To help you find the Best Acid Reflux Relief, TopConsumerReviews.com provides you with an in-depth Prilosec Review. Prilosec is one of several Acid Reflux products in our review that use omeprazole, a proton pump inhibitor, that reduces the overproduction of acid that can lead to symptoms like heartburn. Although these omeprazole-based products aren't designed to give immediate relief of such symptoms, studies showed that almost 80% of Prilosec users were free from heartburn on their first night after taking it, and 94% of their customers were satisfied with how Prilosec worked for them. 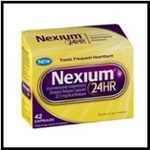 Those are numbers worth considering when choosing an Acid Reflux product. Take Prilosec with a glass of water before eating breakfast. It's important that you take it for a full 14 days before deciding if it's effective for you. While the manufacturer doesn't recommend that you repeat that two-week course more often than once every 14 months, we found reviews from more than a few users who take Prilosec daily at the recommendation of their physician. We even found someone who uses it for their dog! Prilosec is recommended for adults 18 years of age and older, unless otherwise directed by a doctor. Overall, Prilosec is a trusted product for long-term relief of Acid Reflux, especially if you're looking for an omeprazole-based product that reduces excess acid and stops heartburn from coming back.